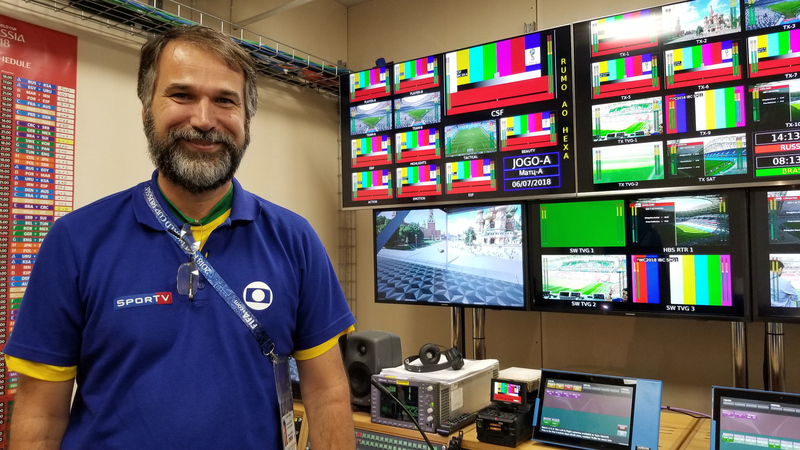 While the nation’s beloved football team didn’t come away with the trophy it sorely desired, Brazil’s top broadcaster on site, TV Globo, made a bold presence felt in Russia at the 2018 FIFA World Cup. As one of the multimedia rightsholders at this year’s event, TV Globo took one of the set positions erected by FIFA and HBS at Moscow’s iconic Red Square. Yet even with the eye-popping backdrops of St. Basel’s Cathedral, GUM, and the Kremlin right outside their window, TV Globo went to new heights technologically to make their on-site set truly shine. TV Globo’s Fernando Wiktor in the network’s control room in the IBC. In the background can be seen an on-screen example of Globo’s AR set located in Red Square. With the help of Avid technology, Globo deployed an impressive augmented reality set to expand upon the limited view from the backgdrop of their set to open up the small space into a more spacious place to call home throughout the tournament for its hosts and viewers. Since the acquisition of Orad in 2015, Avid has been expanding its studio graphics technology, including growth in the AR space. Avid’s Maestro | AR is giving Globo the ability to create 3D virtual objects that blend in as part of the environment during live broadcast. Globo is using the technology to expand its backdrop to include more of the sights of Red Square. Avid’s Maestro | Designer, meanwhile, is a tool used by graphics artists and designers to create traditional graphics but in an AR environment for broadcast. It can import stills, video, and graphics from other third-party programs. UK-based Gearhouse Broadcast also partnered with Globo to integrate the set, which was originally built and tested in Rio de Janeiro before heading across the ocean for a final round of testing in London.